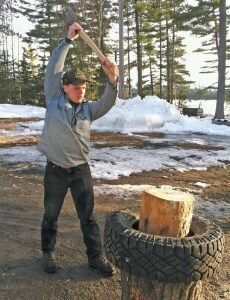 Here, a tire is mounted to the splitting block to contain the split firewood and keep the wood upright. endeavor may be splitting and stacking your own firewood. Once you get in a rhythm, and especially if you have help, the process can be fast and enjoyable. Unfortunately, too many people assume wood splitting is a grunt activity, best achieved with brute force. The truth is that wood splitting is a mix of being able to “read a log” and developing safe, efficient movements throughout the process. The key to efficient firewood processing is minimizing the number of times you handle each piece of wood. If you’re able to skid full-length firewood logs to your processing site (hopefully right next to your woodshed), you can divide your friends and family into teams of buckers, splitters and stackers, creating an efficient assembly line. If you’re working alone, pace yourself while splitting and alternate to stacking when you get tired. If you’re splitting by hand, you’ll need to decide if a splitting ax or a maul is a better choice. A splitting ax shouldn’t be confused with a chopping ax with a maul. The bit of a splitting ax is dull to the touch and relies on the wedge of the ax cheek to split the block. nly 3 to 5 pounds, whereas a splitting maul with its heavy head can weigh between 6 and 16 pounds. Of course, the advantage of a maul is that the additional weight means the head does much of the work. Other considerations include handle material and length. While purists insist on hickory handles, novices should stick to more forgiving fiberglass or composite handles until they fully develop their hand-eye coordination. Handle length is largely a matter of personal preference, though a shorter handle offers more control. The splitting block serves several purposes. First, it protects your ax or maul from damage by allowing it to pass through the firewood, safely landing in the splitting block below. Splitting on the ground not only increases the chances of ricocheting off a rock, but you also have to bend over further to set up and collect the wood. One common complaint of using a splitting block is that the split wood falls off the block, leaving you with an ever-smaller splitting target. 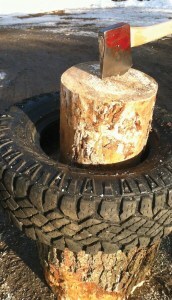 One solution is to mount an old tire on top of the splitting block and place the wood to be split inside. 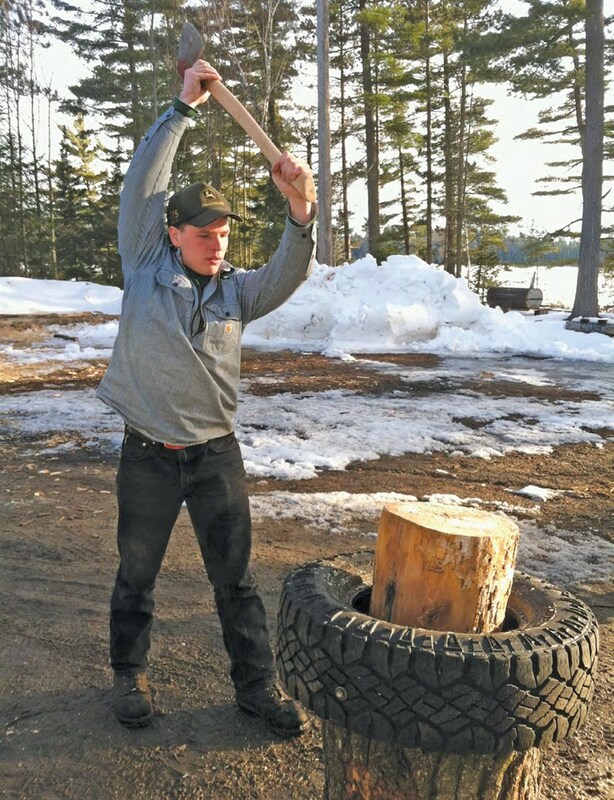 The tire will help to hold the wood in until you’re ready to move the whole tire load. 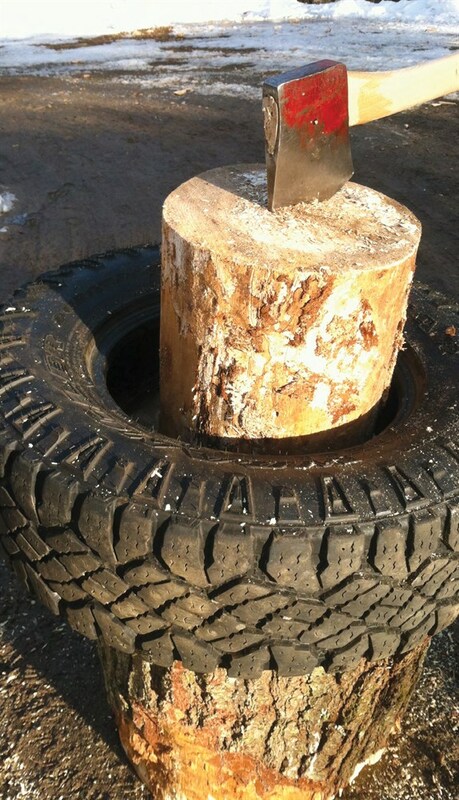 Use screws or lag bolts to fasten the tire to the stump. Another take on the traditional splitting block is to cut the top of the block at a slight angle. This allows you to match the angle of the firewood block (since they are rarely perfectly square) with the splitting block by matching the two angles. brought directly over the head. It’s common to see folks split wood by swinging the ax or maul over their shoulder. While it may feel natural, this method wastes energy and lacks precision (hitting the same spot twice). Instead, raise the ax or maul directly over your head, keeping it in perfect line with your body. 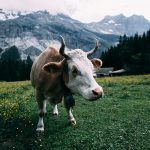 As you raise the ax, be sure it doesn’t drop behind your head, since it will require additional energy to move the ax but doesn’t offer any additional mechanical advantage. 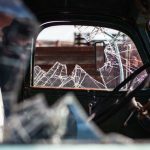 Don’t aim for the middle of the block; instead you’ll want “hanging steel,” allowing the bottom corner (heel) of the ax to overhang the edge of the block. Working the outside edge will encourage a split to form. If you have a particularly large block, it may be useful to use a “slabbing” technique, where you work your way around the outside of the block splitting off long slabs. As you do this, the block will form corners that you’ll split off in subsequent rounds. If your block has a knot on one end but not the other, place the knot on the bottom so you can establish a splitting kerf. 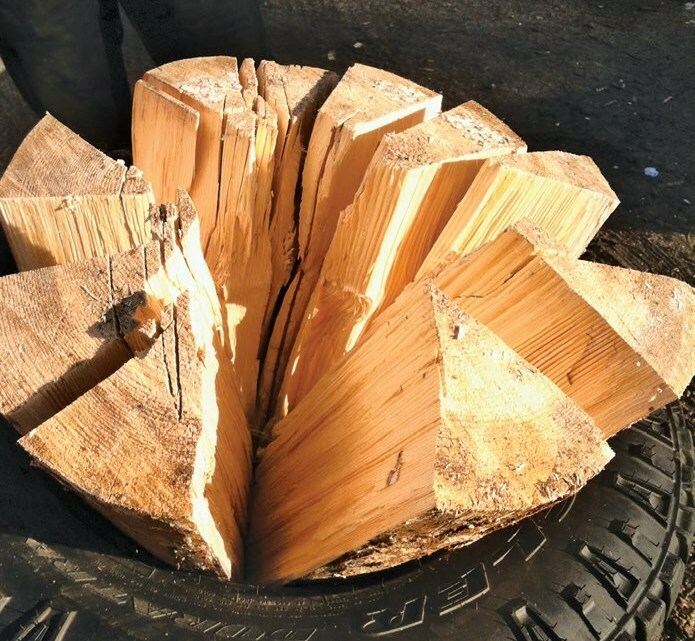 If a block has a whorl of knots that’s difficult to split, set the block aside, but don’t forget about it – knotty wood is exceptionally high in Btu due to knot density, making it perfect for extra-cold nights. Metal splitting wedges are useful for knotty pieces. In some cases, you may need to use a series of wedges in a line to get a stubborn block to split. If your wedge or ax pops out as you attempt to split a knotty, stubborn block, you can use a chain saw to cut a shallow X in the top of the block, giving the wedge a place to start the split. Alternately, a block can be made easier to split by bucking it in half and splitting each shorter section. I split most of my firewood a year in advance, meaning that as my woodstove is burning I’m often at the woodshed splitting next year’s wood. 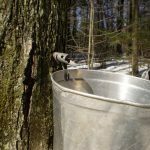 One advantage to splitting wood in winter (besides avoiding blackflies) is that the sap in the wood freezes, allowing the wood to cleanly “pop” apart. While I appreciate the simplicity of splitting with an ax or maul, there are some circumstances when a hydraulic splitter represents a more practical solution. 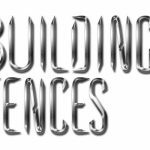 If you’re faced with splitting an exceptionally large volume of wood, or if the wood is of a particularly obstinate species (elm, for example), renting or purchasing a hydraulic splitter may be in your best interest. 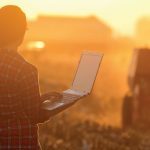 If you own a tractor with a three-point hitch, you can avoid the hassle of needing to maintain an additional engine by running the splitter off the tractor’s hydraulic system. While some hydraulic splitters operate horizontally, others operate vertically, and a few can be run in either position. Vertical splitters are particularly handy when you’re dealing with large rounds of wood, since you can usually slide them into splitting position without lifting. Horizontal splitters offer a comfortable work height for rotating logs or loading them into a truck or trailer. Regardless of your chosen splitting tool, make sure you practice safety, always wearing foot and eye protection. Finally, a note about stacking: Make sure your wood is stacked in a dry, well-ventilated area. Pallets make a great stacking surface because they keep the firewood off the ground and promote circulation. If you don’t have a woodshed to stack your wood in, consider using corrugated roofing with ample weight stacked on top. Also, the longer you’re able to dry your wood – one to two years is ideal – the more efficiently it will burn.